It’s been a tough week here at slowly-by-slowly on the extended family front. I haven’t had a moment to queue or post one of my carefully-written stock posts crafted last summer about the progression of summer 2004 in Turkey with the traveling band of Karagöz puppets that decided to personify the internal messages in my head…so I thought I would take a moment to write about what cross-cultural coping looks like in this house of ours here in New England. Despite these mini-clashes of culture and moments of figuring out shared together, I have felt totally depressed and powerless. I have also seen M. step up and do just about all of (vs. more than half) the dog walking, house cleaning, dish washing, food cooking, bill paying, house dealing possible. This week, the Karagöz puppets have been a bit bewildered by all of this, and have been pretty silent, not knowing what to make of challenges we face at the hands of the social welfare system designed to support our family member with a disability. M. has been equally confused. We have been muddling and muddling and occasionally puddling. The little chorus of dancing ladies has offered me numerous glasses of çayover the week, most of which remain untouched on my dresser and desk. They are trying to get me to take care of myself. Karagöz did a few flips and twists and tried out some new rhymes to get me to laugh, but I really was having none of it. So, little puppet people in my head, sorry about that, please come back and let’s re-engage? As I woke up today in the sun, I realized just how much the Turkish side of this marriage has carried this week, especially in the area of lemonade-making. There is an old cliché in American culture that seems to be getting a run for its money as of late – make lemonades out of lemons. I love the sentiment. We obviously hit a big lemon in the proverbial road trip of life this past weekend regarding our family member’s care, and have been frantically searching for lemonade recipes since then. Yesterday, we had a good dose of lemonade – the best possible kind of lemonade – with respect to the care of our family member, so I suppose lemons are on my mind. So, as I got up, I tried to do something nice. Our good friend, a Turkish woman who I respect deeply, taught me how to cleanse the air in the house after cooking a fish. 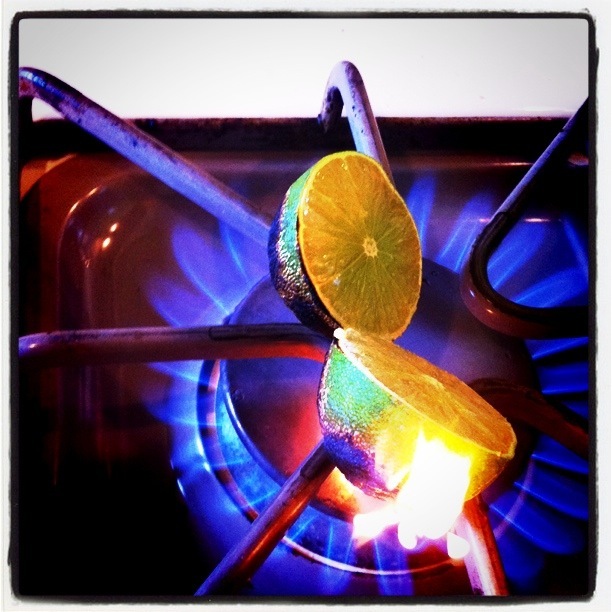 She places a raw lemon half right on the gas burner flame – and the scent around the house – well – it’s just lovely. Having only a lime in the house, and an old, crusty dry one at that, I figured citrus was citrus, and hacked away at halving it. As the lime oil began to swirl around the house, I felt a bit enlivened. I hauled out the slow cooker, made a “pantry sauce” from whatever was left in the pantry (canned tomato, pumpkin seed oil, garlic, bay leaves, thyme and half a bottle of syrah from last weekend) that is now home to four defrosted and seared chicken legs. I hope to surprise M. with a nice dinner. Of course, before the domestic bliss could blossom into its best self, I realized the lime was burning…and now our house was filled with the smell of burnt lime. 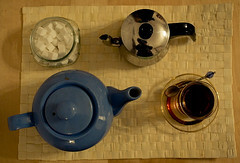 As this is a cross-cultural home, I decided to clear the air with a fresh batch of chai – not çay but chai. Not the kind you buy at Starbucks, either. However, the chai story does not end there. In graduate school, I had the great good fortune to make a wonderful set of friends, one Austrian and one Southeast Asian. When this couple had a baby, I was lucky enough to spend some time with the baby’s Southeast Asian grandmother – who always made the most wonderful spiced chai. 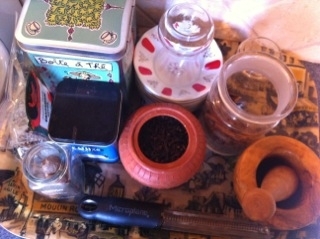 So, the chai made today in my house, to ward off the burnt lime smell and week of challenge, involved 1/2 a saucepan of water, a handful of Assam tea leaves with rose petals, crushed bay leaves, a sliver of fresh ginger, ground cardamom, cloves and nutmeg and a shredded stick of soft cinnamon). So, the house smells fantastic, the sun is shining and the Karagöz puppets are starting to awaken again. I think I see Karagöz himself doing back flips over in the corner of the living room. As for me? I am taking a break as soon as I can, and plan to finish up the lemon-infused week with a good re-read of one of my favorite expat books – Driving over Lemons. So, whether it is lemon or limon, çay or chai, be well, muddle through whatever you face, take care of eachother…and see you soon for more highlights on the road from Selcuk to Bozcaada coming soon. This entry was posted in A Karagöz puppet battle, Cross-cultural learning moments, Turkish Food!, Visits from the Karagöz puppets and tagged cross-cultural marriage, family, Karagöz and Hacivat, Lemonade, Masai Mara, New England, Turk, Turkey, Turkish, United States, Yankee. Bookmark the permalink. Thanks for the cross-cultural slant on this complicated problem. You raise a lot of perplexing questions! Yes, many more questions than answers. I guess the muddling through and conversations are part of the “getting through tough times in a cross-cultural household.” I am not sure we figured out anything, but as this blog documents one cross-cultural marriage, it seemed important to comment. Thanks for your comment and I hope I at least made you laugh with this. We can relate to the dilemma. Liam recently organised his disabled brother’s transition into care after 40 years of care by their parents (they have growing health issues of their own and can no longer manage). Handing the care of a loved one over to strangers was really hard. Visions of neglect and abuse are never far from the mind. So far, things are going well and his brother is thriving. Many Turkish families care for their own within the family. But, this isn’t universal and Turkish institutional care can be horrendous. Thanks so much for sharing this – I can totally relate. I am glad to hear that your brother, Liam, did and is adjusting to that shift well – and that his care is good. We have been thrilled for years at the good care our family member has received – which made a particularly egregious dereliction of duty re: healthy and safety even more shocking and horrific. I am not using hyperbole here – will share offline sometime…M. and I have had many conversations about the Turkish approach to the care of folks with disabilities…and if we could afford the staffing at home, we would. I think so much of the choice is around labor market realities re: help…and the stories we hear via Amnesty Int’l re: electric shock therapy, et alia, well of course, terrible. I do hope that if the EU bid ever does more forward, this will help…but no Turk I have ever met has thought it a reality…many topics here…wishing we could meet for a drink or two to share & hash it all out. Hopefully this coming summer. here’s an e-hug for you and yours – keep taking care of each other. I am sorry to hear how hard things are over there. I think Italy is similar to Turkey in that the disabled, sick and elderly are mostly kept at home, and it is mostly the mother that takes full responsibility for care for that person. I often see older women on the street with middle-aged mentally handicapped children and wonder what will happen when the mother gets too old and frail to care for the handicapped child. Certainly there are not right answers on how to handle these difficult problems. On a slightly lighter note. I often use the expression”when life gives you lemons, make lemonade.” Italians just don’t get it. They have no clue what I mean. For an Italian, if life gives you lemons it is a wonderful thing. A yard full of lemon trees heavy with fruit is the dream of many in southern Italy. There must be an expression in Italy that says the same thing, but I do not know what it is. When I find out, I will let you know. What about in Turkish? It would be really good to meet up when your next over for a drink (or three) and a natter. Bring on the summer! This is an eexlclent post which brings together many of the aspects of successful leadership in a cross-cultural environment really well. It doesn’t matter what someone’s past experiences are they will always be working outside of their existing comfort zone when moving into a different cross-cultural situation. Those that appreciate that from the outset and modify their approaches while listening to colleagues are best placed to succeed. Thank you for your comment and for visiting. Listening and being responsive are key, indeed. I try to get at how my partner and I do this (and fail to do this) here in this blog as I think there is not enough real talk about what cross-cultural communication (esp. in relationships) really looks like.